Participants dance with cardboard anchovies on the United Nations plaza at "Fishes Feed Us," the 2007 event designed by Cynthia Pannucci [Credit: Marcia Rudy]. She envisioned a light tracking device on top of the terminal containing fiber-optic cables that would pipe light into etched glass prisms mounted at the top of the building between the support columns. She thought the special effects would reflect the beauty of the water vista that the ferry riders were about to experience. Her idea never came to fruition, but it kick-started a life-long career connecting the realms of art and science. Pannucci has blue, lively eyes. When she speaks, she decorates her sentences with words like “glowing,” “sensual,” “kinetic” and “dazzling.” She says that she has always expressed her art through various forms of technology. Besides printmaking, Pannucci built her own darkroom to silkscreen photographs on to fabric. She started sewing her silkscreen pieces into quilts a few years later, after moving to Vermont during the boom of the crafts period in the early ’70s. She stayed for a decade until her friends started noticing that she was making contemporary work even though she was using the traditional medium of quilting. They advised Pannucci to move to a city like New York to explore her work. When she did, the city had recently instituted the Percent for Art Program, which allotted one percent of the funding for any public architectural project towards art pieces for the building. Pannucci believed that the program would allow her to collaborate with engineers and architects to create technology-inspired pieces of public art—which led to her idea for the ferry terminal. She started a non-profit organization to help attract artists to that project. The project eventually fell through, but Pannucci decided to see if she could find enough local artists to keep her small organization alive. An advertisement that she posted in a newsletter attracted 20 or so artists drawn to science. Pannucci polled their interests, and they had quirky projects in mind. They wanted to arrange television innards, create moving works of art with blinking LED lights or disembowel cathode ray tubes—and they wanted to discuss their projects with each other. Pannucci restructured her organization to do all that, and Art & Science Collaborations, Inc. was born. For 20 years now, Pannucci has cultivated ASCI to connect science-inspired artists, art-inspired scientists and anyone else interested in the cross section of the two fields. Since 1993, she has organized an annual digital art exhibit at the New York Hall of Science, and she still edits the ASCI (pronounced ask-ee) e-Bulletin that she launched in 1990. The e-Bulletin links members to galleries and events at the interface of art and science. Video: Adrienne Klein discusses the “Science and the Arts” program at the City University of New York. Pannucci left New York several years ago, and now works out of her adobe hut in a Santa Fe artist community, though she is still active in New York City public art. Two years ago, she developed Fishes Feed Us, a performance art piece on the UN plaza for the 2007 World Environment Day. 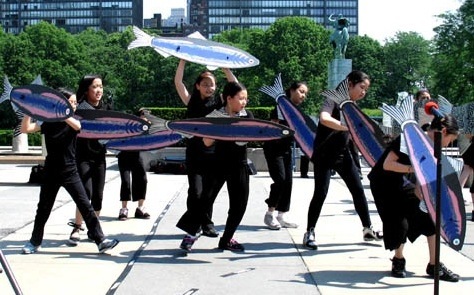 For Fishes Feed Us, she hired a choreographer to teach New York school children a dance about the declining fisheries on the Indo-Pacific coastline. The dancers carried fish cut-outs that Pannucci designed, and they stopped throughout the piece to read parts of their online conversations with Malaysian and Filipino children through a blog that Pannucci developed for the project. “She has a passion for using creativity to inspire people,” says Leonard Sonnenschein, the president of the World Aquarium in St. Louis, who funded Fishes Feed Us. Most recently, Pannuci curated ASCI’s 2008 digital art show, which has been at the New York Hall of Science since October. The pieces colorfully contrast with the bland hallway of the museum. These works of art include a spacescape dotted with humans mimicking the shape of galaxies, a nighttime snapshot of a fictional atrium that uses the flight of magnetized moths as an alternative energy source and pictures of taxidermy collections displayed in jarringly sterile clear containers. Natalie Jerremijenko brings an artistic approach to science. Mathematicians use yarn to solve problems. Lucy the hominid as a work of art. Cynthia is one those rare, dedicated individuals who has aligned her astute personal vision with that of the community-at-large. Her passion for all things Art-Science related have brought people into contact, and things into being, that might otherwise not have been possible. It has been such a pleasure to think outside our boxes, thanks in large measure to Cynthia’s tireless efforts. With appreciation, Sam and Claire. Such a unique person, and the link to the “Fishes Feed Us” video is really cool — you should consider embedding it directly in your story so more folks see it!